The ISS provides a unique vantage point for observations of Earth and space. Compared with typical satellites used for Earth observation, the ISS provides better spatial resolution and variable lighting conditions. The ISS can improve disaster response and advance studies of agriculture, water quality, natural resources, the atmosphere, maritime tracking, land use, and much more. 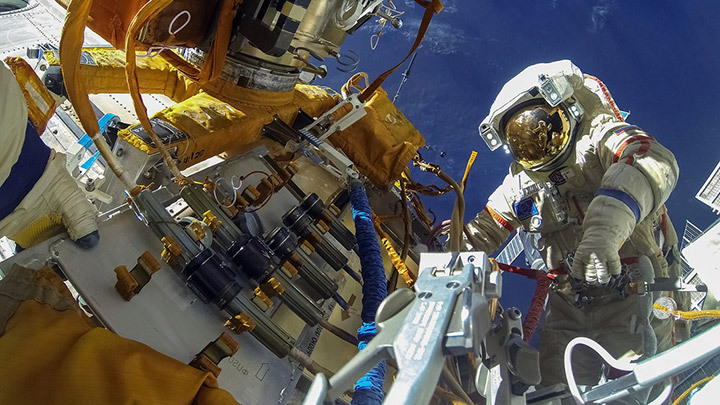 The ISS also serves as a technology test bed, a platform for studying elusive particles, and a conduit to resource sustainability and the democratization of imaging data. The ISS is in low Earth orbit, at an altitude of approximately 250 miles (similar to the distance from New York to Boston). The orbital path of the ISS also gives it a unique point of view, traveling over the regions of Earth that contain more than 90% of our population. Compared with typical satellites used for Earth observation, these features provide (1) better spatial resolution in images and (2) variable lighting conditions, which traditional satellites cannot achieve because they pass over the same area at approximately the same time every day. Earth observations using a variety of instruments, from handheld cameras to advanced imaging systems, are helping to improve sustainability by enabling natural-resource management and to democratize global remote sensing data for growing social needs (e.g., smart cities, crop yields, entertainment, and improved global security information for disaster management personnel). Disaster response: Scientists use images from the ISS to monitor global hazards and natural disasters to help make response efforts faster and more effective. For example, astronauts used these capabilities to aid in disaster recovery efforts after the 2011 Japanese tsunami and to monitor the melting of glaciers that caused a Russian avalanche in 2002. Spectral imaging: Some of the imaging systems on the ISS detect more than just visible light (the part of the electromagnetic spectrum that we can see with the naked eye). These instruments are capable of spectral imaging, which can image phenomena such as atmospheric gases, temperature variations in the upper atmosphere, and features of coastlines, such as water clarity and chlorophyll content. Such imaging techniques can also catalogue geospatial, thermal, and magnetic information as it relates to oil, gas, and mineral exploration. Monitoring of land and sea: Land use studies can provide valuable information for fields such as agriculture (e.g., examining the types, health, and abundance of plants in an area) and urban growth (examining expanding land use for buildings, etc., that result from growth of cities). The ISS also has the first space-based method to track global maritime traffic. This method can monitor speed, position, course, cargo, and other information about ships in open water (compared with Earth-based systems, which can monitor only coastal waters). Fundamental sciences: Studies in biology, geology, biogeography, and hydrology include analyzing aquatic organisms, coral reefs, endangered species, and glaciers; capturing features of glaciers, agricultural fields, cities, and coral reefs with unprecedented detail; exploring the distribution of species and organisms in geographic regions over time; and studying water’s movement, location, and quality. Space imaging: Looking away from Earth, studies of space from the ISS can measure or detect phenomena including X-ray sources, cosmic rays, and features of the sun’s radiation. Sometimes these abilities are unique to space: for example, sensors must be high above Earth’s atmosphere to measure the full cosmic ray spectrum. Research of these phenomena advances our understanding of particle physics, planetary science, atmospheric science, and the origin of the universe. Physicists and astronomers can measure X-ray sources such as black holes and neutron stars, and they can search for elusive or theoretical particles such as antimatter and particles potentially associated with dark matter. 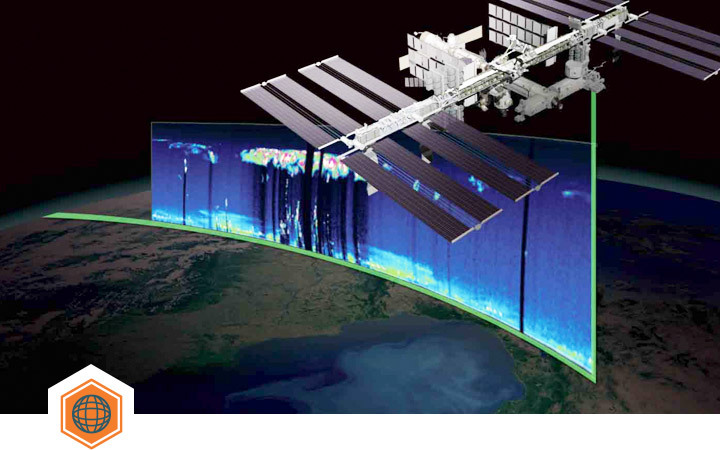 Technology validation: Along with serving as a unique vantage point for imaging and data collection, the ISS also provides a platform to validate technologies or products that benefit society—it is a test bed for data collection and aerospace technology development, including new approaches for Earth observation, atmospheric monitoring, and spacecraft or satellite technologies. A commercial project that significantly improved intensity measurements and, subsequently, path predictions of strong tropical cyclones using a measurement technique from the vantage point of the ISS. A variety of academic and commercial organizations using images of the coastal ocean to study and develop predictive algorithms for water quality, harmful algal blooms, mineral mapping, and ecosystem responses to environmental stress. A particle physics detector that advances knowledge of the universe and leads to the understanding of the universe’s origin by searching for and studying antimatter, dark matter, and cosmic rays—a project which continues to publish new findings from its 5+ years of operations. A commercially operated Multi-User System for Earth Sensing (MUSES)—an Earth-observing, precision pointing platform that can host up to four instruments simultaneously and offer the ability to change, upgrade, and robotically service those instruments. An academic project that tested how the harsh space environment affects a new type of charge injection device sensor for use in environmental monitoring and defense interests. An international collaboration to make the first space-based observations of the chemical composition of meteors entering Earth’s atmosphere—which recently captured the annual Perseid meteor shower (from above). The ISS is a unique remote sensing platform. It has a human crew, a low-orbit altitude, and orbital parameters that provide variable views and lighting. The presence of a crew provides options not available to robotic sensors and platforms. This page lists the multiple instruments, both externally mounted and operated from inside the Station, used to collect data on the Earth's oceans, atmosphere, and surface.